With the new season fast approaching, we look at Aston Villa supporters who share a similar ethos to MOMS in trying to break the trend of supporters simply being passive consumers. If you pay good money for your match day tickets, don’t you want a bit of atmosphere? 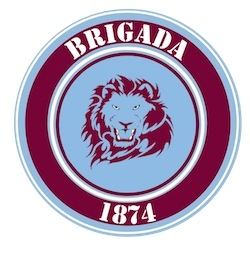 First up, is the group of Villa fans known as the Brigada 1874. This season they will be found in L8 of the Holte End, so if you like the sound of them and want to join in, you know where to find them. Below, in their own words, Brigada 1874 detail their history and the road ahead. 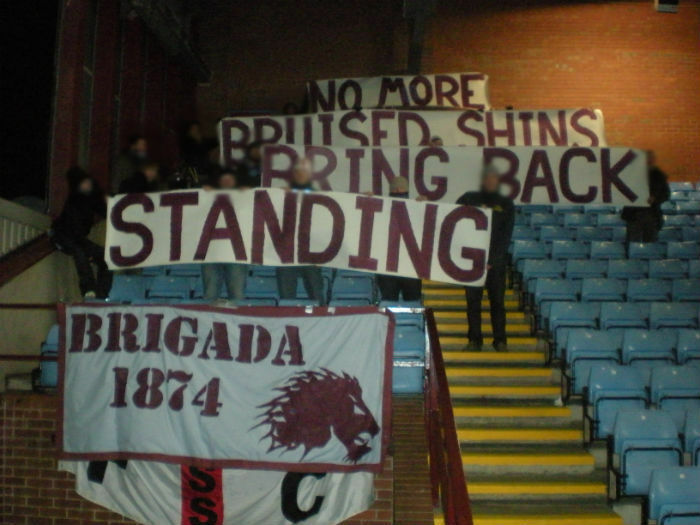 Brigada 1874 was founded at the start of the 2010/11 campaign by a group of lads sharing similar principles and a common desire to see Villa Park return to something like the cauldron it once was. The aim from the beginning has been to reignite the Villa Park atmosphere and give a collective kick up the backside to what has become an increasingly sterile environment in B6. The idea for the group came about following a 5-a-side tournament in Belfast involving fans from FC United, St Pauli, Celtic and Barcelona amongst others. A few Villa fans joined forces with a couple of mercenaries and entered a Villa team into the tournament. Although we weren’t particularly successful (half the team were struck down with alcohol related illnesses on the 2nd day of the games) the trip was an eye opener to see and hear what other fans were doing at their respective clubs. St Pauli are renowned for the vibrancy and loyalty of their fans, while FC United are a supporters run club where scenes at games are more akin to a bygone era of football, far removed from the “prawn sandwich” brigade that have invaded many a top flight stadium. We also talked with members of Celtic’s Green Brigade, who’d grown from a group consisting of around eight members at their inception to having their own section at Parkhead. After catching the same plane home as the dingles, who’d been playing a pre-season friendly over in Ireland, we decided to try and kick start something down the Villa that would embrace a similar style of support as the groups we’d met in Belfast. After the first home game of the season against West Ham, we called together a group of lads who we thought would be interested in forming a group that would offer unconditional support for the club. We discussed what we wanted from the group, what we thought we could do at the club and what we’d be called. After some discussion the name Brigada 1874 was proposed and later agreed on by a majority present. The title is a fairly uncommon one for an ultra group as it references the year our club was formed as opposed to the year the group was created. However we thought it important that we pay respect to the club in the group’s name. We also agreed that we’d use the term ultra to describe the group; we knew that this would prove contentious amongst some fans but also agreed that it was the most fitting term for the group. As expected we received a lot of criticism in the early days of the group. Most of those opposed to the group did so in principle based upon the negative connotations associated with ultra groups and in particular the violent picture that the tabloid media in the UK paint of ultra groups. While in some countries ultra groups have violent elements this is not a staple of ultra groups as a whole and the ultra scene on mainland Europe is for the large part far removed from the hooligan scene in the UK. The word ultra means “beyond” and relates to ultra groups unflappable support for their team, regardless of the fortunes of that team. Most teams in Europe have some sort of ultra section but in the UK the scene is small but growing, the best examples of such groups being Holmesdale Fanatics at Palace, Green Brigade at Celtic, Stanley Ultras at Accrington and Union Bears at Rangers. In the very early days, we also received some bad blood from elements around Villa who took offence at our anti-fascist and anti-racist stance. We made it very public from the start that the group would not tolerate anyone who discriminates based upon race, religion or nationality. As much as a matter of principle as a means of warning off those who bought into the media aspersion that ultra=far right boneheads. Racism is a tool of divide and rule and has no more place in football than it does in wider society. Like in life in general, strength lies in unity and we do not believe there should be a place at the club for those who would stand shoulder to shoulder with someone in the ground, who they would later chase down the street because of their nationality or religion. Our first outing as a group was at the League Cup game at home to Burnley. We hastily botched together a few tifo flags, took the newly made (and far too long group banner) and located ourselves in the lower north stand. From the off we were confronted by stewards who insisted we take our seats and threatened to bring the police in if we didn’t comply. This was to become a familiar story in other cup games that we attended in the lower north. Despite the differences of opinion with the stewards, it was a decent enough start. Since that first tentative outing the group have come a long way, we’ve spent time creating two-sticks, banners and flags and burnt large holes in our pockets in the process. We’ve kept displays at away games to those when we can get the majority of members together. The logistics of putting on a display means that if you don’t have the numbers then it isn’t likely to work. We’ve had a streamer display at the ill-fated cup game at the sty in the 2010-11 season when a game of flare tennis was overshadowed by a football match, we put of a confetti display at Sheffield United in the cup and have had group outings at Man City, Bolton, Bristol Rovers and a few other away games last season. 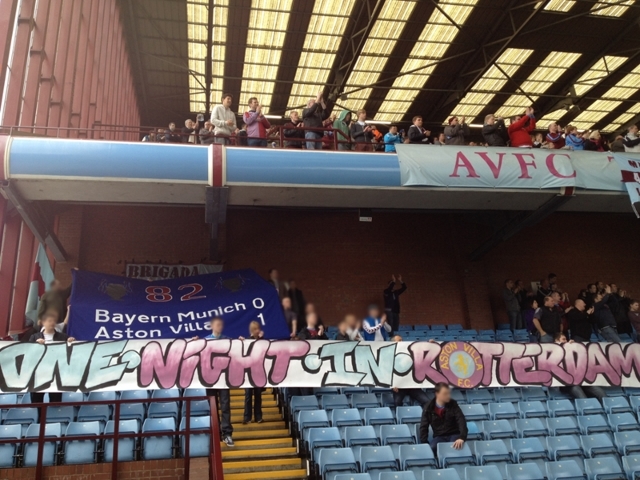 The 2011-12 season saw us put on paper mill displays supporting Villa youth player Janoi Donacien’s families claim to stay in UK and celebrating the life of the late Bernie Gallacher. Like all fans we have also offered our full support for skipper Stilian Petrov in his ongoing battle against Leukaemia. 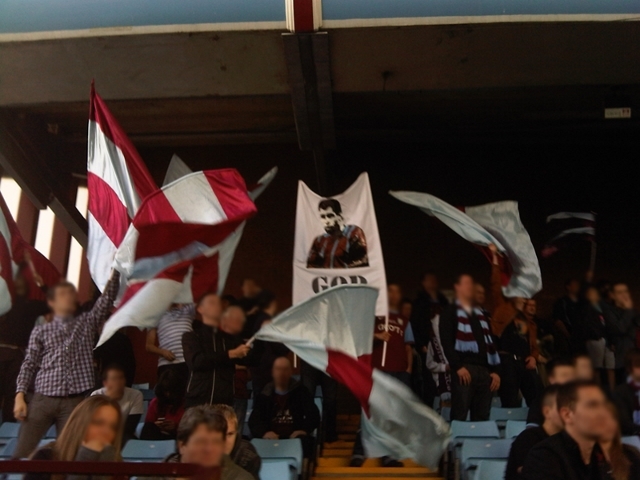 For the last home game of the 2011-12 season we put on a 2-stick and paper mill display celebrating the anniversary of the clubs finest moment, 30 years ago in Rotterdam. From the start of the 2012-13 season we moved to the other side of the Holte End in L8. This area is much bigger than L1 and gives us far more opportunity to grow as a group and put on more elaborate displays. We hope to carry on building the group in L8, raising funds for materials for the group and making contact with people who are interested in getting involved. Despite our earlier problems with some stewards in the lower north, we’ve been favourably received by the club and last season enjoyed a fairly amicable relationship with the stewards in the L1 and L2 area of the Holte and we expect this to continue in L8. Recent seasons have been tough to watch for everyone; the lacklustre and drab performances on the pitch has been mirrored by a fractious atmosphere in the ground. While the die-hards kept on singing regardless it was obvious that the type of football on the pitch is boring some to sleep. We hope that this will be different soon and that the Villa boss can soon bring a more vibrant style of play to the team and gets the players playing for the colours. In recent years football grounds have been turned into arenas of passive consumption, many decent fans have been priced out of supporting their club and health and safety legislation has been abused so badly that getting a flag into a ground can prove harder than getting a straight answer out of a politician. However, the group are in this for the long haul and expect to grow. The example set by the likes of the boys at Palace and Celtic show what can be achieved in grounds in the UK if people put the effort in and go against the tide of modern football. We hope that we’ll see Villa Park moving towards being returned to the cauldron it once was. Interestingly I see a few other fans of other clubs linking to this article on their forums and discussing the same atmosphere problems. It’s a universal problem – maybe we can organise an atmosphere week! A bit of healthy competition to see who can put on the best show and make the most noise? I’ve always wanted to see more colour and passion in the Holte, it could be the cauldron of English football, when we look at fans of Marseille, Dortmund, Rapid Vienna, Villa could have that reputation from the greatest single stand in the world. 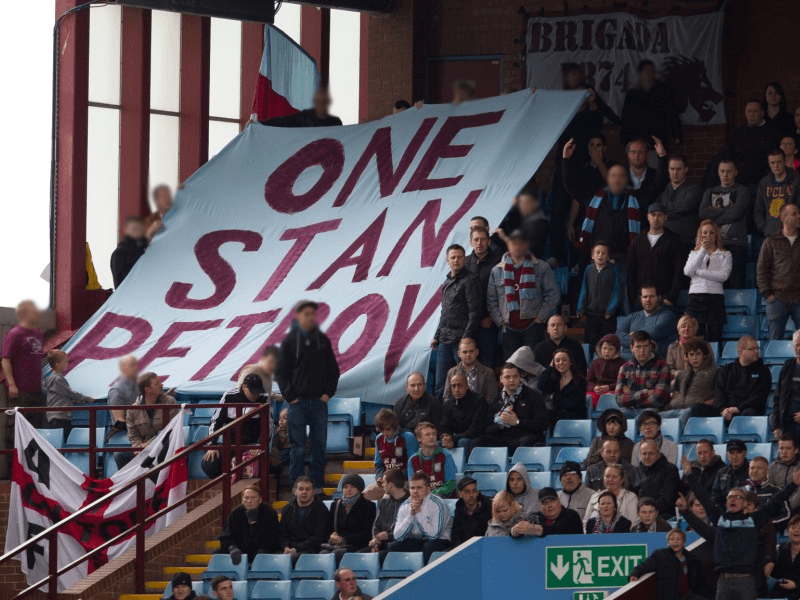 danvilla2 It’s a tough ask, when the club won’t even allow a banner that supports Petrov to be surfed for a minute. There’s a lot of fans who want to have a better atmos experience for their money, but it’ll take a hell of an effort. If it’s more of an experience, maybe it’ll help attract the crowds back too.